In all my years of gardening I have never had such a satisfying or easy job. This is the first season I have been able to plant seedlings into the garden, or seed in some cases, and just watch them grow.. apart from watering, and weeding occasionally. I have usually found, over my entire gardening life, that once my plants go in the ground I’m then watching for when I need to feed them again to keep them growing fast… in the past I used things like liquid fish to give them a boost or liquid comfrey.. in more recent times , I’ve used EF:Nature’s Garden, or EF:CalPhos etc and this season I made my own liquid fertiliser I called Kay’s Liquid Gold. It worked, it was good but I don’t need it anymore!!!…. All of my plants are growing from day one and not stopping until they are ready to pick. Everything is growing faster and ready to eat earlier than I have ever had before, and I don’t need to apply any kind of foliar or solid fertiliser to keep them growing… and their brix levels are high. See chart below. 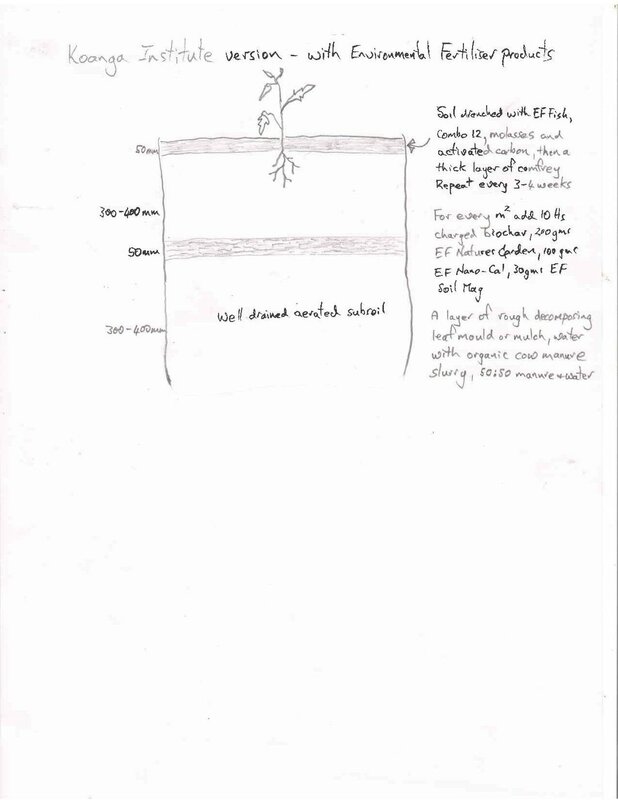 It is essentially about getting the basics right … air.. 50% air in our soil, moisture, always moist… then carbon.. humus and biochar ….then minerals and microbes. In my sandy soil I had the air once I double dug it, I had water to put on, I made a lot of compost….and I put on lots of fertiliser, albeit the really good stuff….. and it continued to be hard work…. We then added clay. Clay has a far higher cation exchange capacity than sand and that helped a lot. The higher the cation exchange capacity of the soil the higher the ability of the soil to hold moisture nutrients and microbes….then we added 5kgs of CHARGED biochar per sq m and that changed everything. Getting the carbon levels high enough to be holding the minerals and water and microbes was the key. We would have saved a lot of time and a lot of money if we had done that on day one!!! If you too have less than ideal soil to be growing the nutrient dense food that is to nourish your family then I know now, how you can vastly improve it, in far less time than it took me. It is all about air, moisture, Cation Exchange Capacity, carbon, minerals and microbes.. in that order!!!!! Buy charged Biochar (charged with balanced minerals and activated with compost tea..not just activated.. that is critical), and apply at 5kgs (ideal amount.. less is still very good) per sq m over the surface of the bed. At 30 cents a kg it is not exorbitantly expensive for a home garden at that rate.
. fork.. the biochar, clay and compost into the top 30cm of garden bed. Continue to apply highly mineralised compost each time you plant seedlings or Nature’s Garden. Balanced minerals or recycle your own humanure and urine. hold the moisture for far longer periods, hold far more moisture.. far less issues with water stress, less often watering necessary. Above all else this soil is now able to easily grow high brix plants because the photosynthesis process is not held up by a lack of air, moisture or minerals, or microbes and so as our plants photosynthesis more and more efficiently they are able to sequester minerals and energy from the universe above them and the microbes and fungi in the soil below them and make high levels of sugars which in turn are stored in the soil and used in part to ‘grow soil’.. ie by getting things working to begin with the natural processes of life building itself.. following the laws of nature….are able to continue building soil and ecological health. By following the basic laws of nature in all of this and putting in the energy to get things ‘going’ again, it is possible to create something that has the ability to take on a life of its own and continue to do the work for us, with some far less expensive and more locally, very locally produced nutrient sources to maintain the system. Ie our own recycled humanure and urine, plus compost made from the carbon crops grown in the garden. We are well down the track at this point of having created our very own Terra Preta dark earth.. by far the most valuable thing we could be investing in on this planet today, in my opinion!!!!!!. PS… IF you don’t like the idea of the double digging, or that is what is holding you up then I suggest you read Shaked’s article following. He is achieving the same result using a different aeration method, which will work for some of us very well. I’m feeling a lot better now. For a few weeks I was very nervous that my garden wouldn’t grow or my veges would be super low BRIX. I’m very excited to be able to tell you that my garden not only looks amazing but that things are growing really well and the BRIX levels are pretty good and going up. My Calphos put the BRIX up 1 point when applied sparingly with a watering can and my Kay’s Liquid Gold has also helped me keep the BRIX up and plants growing well. I am most impressed with the urine charged biochar however it only works super well from day 1 when it is ground quite fine rather than being in big chunks. All of the plants that I have planted into finely ground charged biochar have not looked back from day 1. They have grown consistently and fast…. Faster than I have seen before in my garden using anything else. My fear was that the growth would be low BRIX growth pushed by the nitrates in the urine… however there is more in urine than nitrates .. and the BRIX of those plants is up so I’m getting more confident that we can do it without the fertiliser, actually I’m very excited. I knew it had to be possible, but I have never done it and i don’t know any body else doing it and most businesses supporting people to grow nutrient dense food tell you not to do it! All the consultants say whatever you do don’t use leaves and compost and manure etc. I know we can now it just takes an understanding of how to use them and organic books do not have it right as far as I can see. Whilst we’ve been focused in the vege garden this past month it has been such a joy to have been watching the forest garden unfold. I can’t recommend more highly actually living in one’s forest garden! They are so so full of life and everybody coming to Kotare feels that now. My little forest garden of 900 sq m is a microcosm of the whole village which is becoming a large forest garden! Check out the green mantle that will continue to rise higher with each month up off the ground until the great returning next Autumn! I love my chickens… they have been in our family now for 30 years or at least this line of Brown Leghorns has been. I taught the Chickens for Eggs workshop at Koanga this weekend with Taiamai and I was reminded of all the wonderful breeds we used to have. I felt sad to think that for various reasons we don’t have the Golden Campines or the Golden Wyndottes we used to have for so long, but Taiamai reminded me that to do a good job of keeping a breed going for the long haul, requires a lot of energy and focus, and we can do that far better with fewer breeds of poultry! Taiamai has Golden Legbars, I have Brown Leghorns and we have Fawn and White Indian Runners, Chinese Weeder Geese and Muscovies. The muscovies sit very early if they are well fed, usually July, then again twice more if they are well looked after it is possible to hatch 3 clutches under 1 muscovy each season. We let them hatch muscovies the first hatch, then use them as our mothers to hatch the chickens and ducks. My forest garden has been designed to provide our chickens and ducks with high protein seeds and berries and the chicken house is designed to be a container for a large compost heap made by the chickens. We throw around 4-6 full woolsacks (fadges) of leaves in there in the Autumn and the chickens drop their manure onto the leaves all winter. It all stays very dry until it warms in Spring then I water it all and fork over and it will compost very fast into beautiful compost for the perennial beds, the berry beds or whatever you need compost for. I only harvest this compost once a year in Autumn when the leaves are falling ready to fill it up again, otherwise it is hard work finding the carbon. I make all the compost I need in the vege garden with the carbon crops I grow in the vege garden but extra compost goes down very well on berries and perennials. There is one key thing that I keep in mind when using chicken made compost.. and that is the Reams Test I had made from our chicken compost a couple of years ago. I’m very aware that to grow nutrient dense food we must apply the right minerals in the right relationships.. and the chicken compost was very very very low in calcium……calcium is key to growing nutrient dense food, and not only is the calcium super low but chicken manure is high on magnesium, so it is critical to add lime, EF:Nano Cal or some form of calcium regularly to the chicken made compost. Options for those not buying commercial fertiliser might be a local lime quarry or simply burnt bones, shells or eggs shells. With the hot Summer days coming on it is time to give your chickens a little extra love to keep them free of pests and keep them laying. Wow, I’m loving the Spring, I feel as though I’ve been saying “look at everything bursting” for a while now, but it literally is all bursting here. There’s a Maakia amurensis here right outside the house truck window, the buds get huge before they burst and suddenly they have 6 inches of beautiful silvery leaf growth, and the mulberries burst then send out their fruit before you know it. Elanor and I have been walking around checking out all the mulberries, they all have some differences in their crops we can see and we have found one that has very long pendulous fruit so we’re excited to taste that. There is a green mantle over the grass layer now, somehow the energy that goes down into the earth over winter lifts again slowly but very powerfully in Spring… and the layer including the top soil right up to the tops of the tallest trees holds the layer of life that we live in and do our best to interact with. What a joy that is. This week it’s tomato growing ideas. I’ve given you mine in Blog 7 and since I designed that process I have been talking with Grant (my mentor at Environmental Fertilsers) many times, and he has given me a recipe based on his experience and that of the guys at International Ag Labs in the USA who are also doing this kind of stuff! This recipe looks pretty far out…. Only for the brave and strong! I’m going to plant a few tomatoes like this as well and keep careful results. Over in the USA they are trying to define a nutrient dense tomato. They say that if they are grown like this they grow much larger plants and crop much more heavily and the fruit tastes unbelievable and has a very high BRIX. If any of you out there are keen to join our trial then please register with us we’ll send you a free packet of Watermouth Tomato seed but you will need your own refractometer. We’ll all use the same seed this year for a start. You could follow any of the three methods we are using to join us on this trial. All of these methods will be compared along with your results at home and we will publish that next winter. In the mean time we will hold a special Tomato/Potato Guided Tour in February and Grant and Kay will be here to talk about growing nutrient dense tomatoes and potatoes. Once you have a good look at Grants’ tomato recipe, you’ll see that it requires digging a small hole or trench if you have more than 1 plant like this. Quite a job. There is a lot of evidence to show that trees grown on holes like this grow to the size of a usual 8 year old tree in 2 years and outperform all others in terms of health and crop. For me the main issue about growing tomatoes like this is that they will also grow very very large and we’ll have to plant them much further apart as well as have a strong structure to grow them on . I know for many people that is to hard, so I’m trying to find some ways that could be made easier. 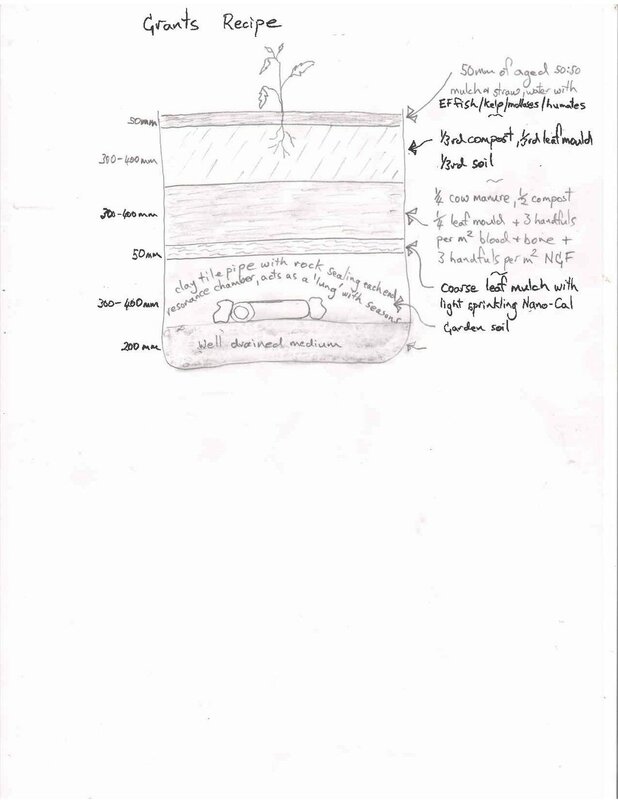 The best idea we have come up with so far is top have a tube of netting for them to grow up the middle of and then, let several of the first laterals can be left on and tied vertically up the outside of the cylinder, so you have a lot more vine to hold tomatoes. 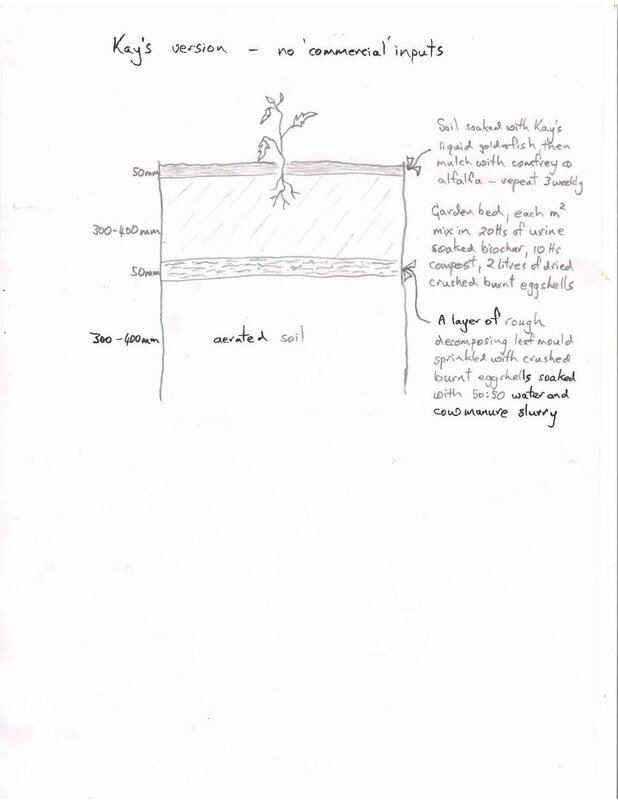 The cylinder would have to be firmly anchored to the ground as it will act as a sail once covered in tomato leaves. This recipe brings up as many questions as it does answers but I think we will learn heaps and if we can use these tomato holes and structures year after year it may not be be so much more work after all! I’m going to have to make sure I collect a lot of leaves next autumn to have enough leaf mould to do this and use for many other things, next season like mulching perennial beds and putting in potato trenches. I decided not to buy in any more fertiliser this year after I’d lost my chance to collect the leaves too late. I think everybody at Kotare Village will be heading for the leaves under the Tilia (Linden tree) as we now know they have ideal leaves for ideal fertiliser, both calcium and phosphate bio accumulator. Plant European veges in summer as a back stop to the classic summer South American cultivars in a cold Summer you won’t starve! Plant carrots, beetroot, lettuce. Starvation years in the past were years when the summers were not long or hot enough to grow the storage crops like pumpkins and corn. Four years ago we had a summer like that here in the Hawkes Bay, be prepared! Maximize diversity you are not likely to lose them all. When you plant lettuce plant several cultivars, when you plant tomato always plant more than 1 cultivar, when you plant beans choose several they all have different qualities and succeed or fail based on differing environmental factors. Learn to grow healthy soil and nutrient dense food – high brix, heritage seeds respond to climate! Our book, Growing Nutrient Dense Food will help with this journey. We’re in the middle of two solid weeks with no sun!! Just when we’re all geared up to get stuck right in we have to stop, at least in the garden beds. My fish fert is brewing away, my CalPhos is also bubbling away, the dried ground eggshells, cow manure, molasses and seaweed is smelling good. I’m going to add to my list of possible soil amendments by making a few netting rounds to pile up with leaves, and leaving them to turn to leaf mould .. next season I’ll collect the leaves in Autumn rather than Spring but we still have leaves under our oaks so better late than never. Making leaf mould from the leaves of trees that accumulate the key minerals we are needing to create the balance our soil needs in order to grow nutrient dense food, will be a way that is possible even for those of you in the city. There are so many parks where trees drop leaves and many contractors sucking them up to take away, it might be possible to ask them if they could dump them in your leaf mould factory. Leaf mould is great for mulching berry beds, perennial beds, putting in the bottom of your potato trenches, mulching crops that will soon cover the bed e.g pumpkins, tomatoes, peppers and eggplants. Also great for mulching in the forest garden. My goal is to have enough linden leaves (tilia spp also known as Lime trees, and amazing bee forage) to make enough leaf mould each year to use under potatoes, tomatoes and to mulch all berry beds and perennial beds because it accumulates both Calcium and phosphate. That means we end up with humus containing high levels of both calcium and phosphate, just what we are looking for. Linden leaves will also be great in the chicken scratch area to be turned to compost by the chickens along with our oak and maple leaves (refer to chart of mineral accumulators for more details). We’re setting up our worm farms and soldier fly farm, this week in the new greenhouse, using just the same design and process that we used for the Koanga Urban Garden Project. As in the Urban Garden they will produce vermicast and soldier fly liquid to use in the garden as well as charged bonechar from under the solider fly larvae….